Additionally we will deal with the letter В. 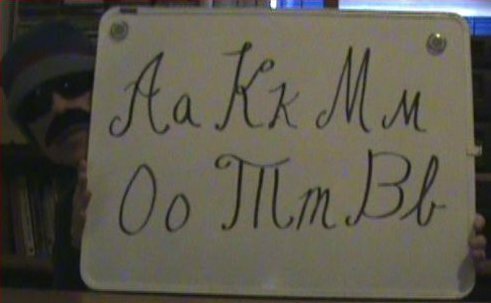 An important distinction to realize is that the Russian alphabet when handwritten can take on an unexpected appearance. The six letters covered in this lesson are shown below in their hand-written form! Notice that the all the letters appear more or less the way that you would expect, except for the Т (bottom middle letter in the picture), which looks a bit like an M from the point of view of an English speaker!